Although I adore flowers and shrubs and trees, ultimately, I started gardening 35 years ago because I love to eat. And while I’m always hugely relieved when I finish canning the last tomato and freezing the last raspberry sometime in November, I start missing my own fresh stuff almost immediately thereafter. So, on the first of December last year, I sowed some herbs in my (fabulous new!) 8X12 foot greenhouse: cilantro, parsley, and lime basil, (an absolute must for zucchini fritters). 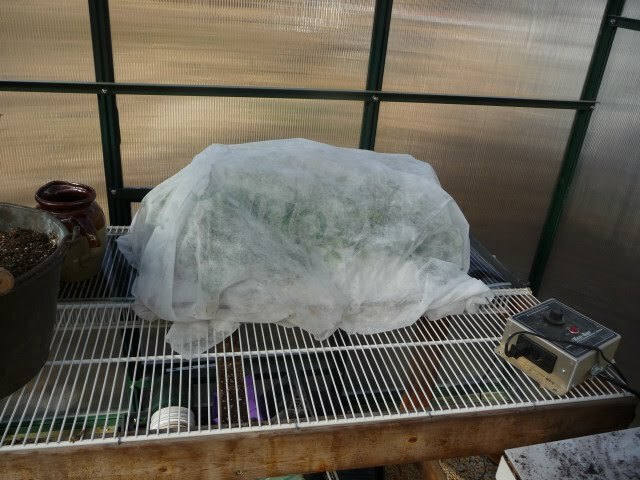 But instead of paying Delmarva Power to heat the whole greenhouse for a few flats of herbs, I decided to experiment and to rely only on a heat mat. On sunny days, even when the temps are in the 20’s the greenhouse can reach 80 degrees, but it drops precipitously at night. To retain as much heat around the flats as possible overnight, I made a very makeshift little seedling tent out of some copper tubing, some rolled solder and a bit of torn row cover that I tuck over the frame. By the end of December, cilantro and parsley (whose seed I’d soaked overnight to help germination), were up and thriving, The basil, which is quite tender, was struggling. After six weeks, the basil bit the dust, but the other two were doing really well. 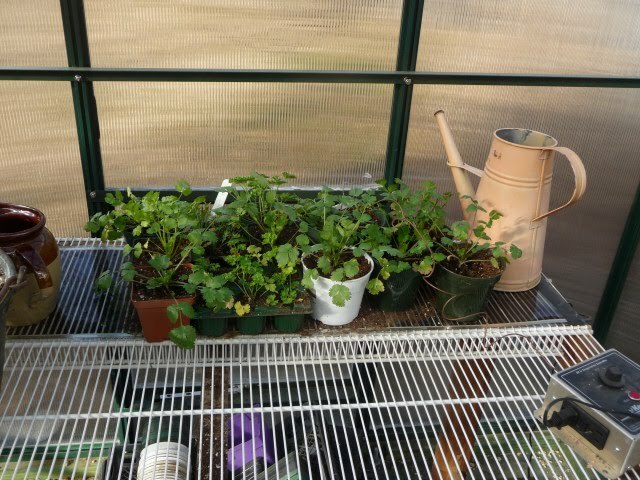 I repotted the seedlings, which means that there was more soil to keep warm, another dilemma. Then I remembered the cast-off 55-gallon food drum my husband had dragged home (he and I are appalling pack rats). I hauled it out of the barn, spray-painted it black on one of the few days we’ve had that wasn’t frigid, half-filled it with water and shoved it into a corner of the greenhouse to absorb heat in the daytime and mitigate temps at night. It’s sorta working, though the pail of water sports a thick crust of ice most mornings. But the herbs are now pickable — well, at least the cilantro is. With a smug satisfaction I’m sure my friends find incredibly irritating, I clipped some yesterday evening to put into the vegetable burritos. Yum Yum Yum. Ain’t gardening great?